See how Facebook compares to Google Search Engine Ads! FACEBOOK GETS MORE IMPRESSONS AND SENDS MORE TARGET TRAFFIC TO YOUR WEB SITE THAN GOOGLE..AT 1/3 THE COST!!! Here is how we are leveraging the new ads that Facebook now offers – we are very impressed with these results! The cost per lead – is $0.31!!! https://www.dropbox.com/s/4n9233dnp0hz7qo/Screenshot%202015-08-30%2014.36.04.png?dl=0. *Note the expense of some main keywords @ $9 per click! For Google Search Engine Ad example we used a $166.00 monthly budget…there were 5,955 Impressions, 72 Website Clicks/Visits, and 8 Conversions (8 Leads filled out the Contact Form) with a cost per convertion of $20.60. and costing $2.31 per click. Facebook has a different Audience than Google – Goolges Audience is based on a “search action” and keyword or key phrase in a spcific location. The person you are trying to reach with Google Ads must be in search mode – like having a fall or medical crisis and proactively looking for care). With Facebook Ads we go after a different Audience. We target people who are “IN IT”– They are careing for some one with a diagnosed condition including Alzheimers, Cancer, Diabetes or taking care of a child. We reach these people by targeting interests (like Health, Alzheimers, Cancer, Stroke, Family, Kids, Child Development, etc) or Groups like Micheal J. Fox Associaltion, MDS Members, etc. or Tittles like RNs, DR. or Thereipist. We want to be where these leads are spending big chunks of time. People spend more time on Facebook than searching on Google: http://www.businessinsider.com/facebook-vs-google-on-time-spent-in-apps-according-to-forrester-2015-6-) – so Facebook Ads are a better investiment compared to Google when you look at cost per lead and opportunity to target to an engaged audience. * Please note how Facebook offers more types of targeting than Google. On Facebook you can target interests and behaviors – On Google Search and PPC ads you are limited to Targeting by Keyword or Key Search Phrase..
WE KNOW WE CAN GET GREAT TRAFFIC TO YOUR WEBSITE!!! NOW OUR FOCUS IS ON LANDING PAGE CONVERTION!!! We are building great new landing pages for you with high quality scores. Compage our quality score to others! OUR RECOMMENDATION – BUILD GREAT LANDING PAGES THAT ARE SPECIFIC TO A TARGETED AD GROUP. Offer: Free RN Evaluation and Care Plan – Specialized Care – Work with the most knowledgeable comprehensive care program for interest. Objective: Get Clicks to Website from Highly Engaged Facebook Audiences who have an active interest in Veterans Groups, VA Benefits and Disability. Objective: Send Applicants to a Career Website or Job Description Landing Page from Highly Engaged Facebook Audiences with Job Titles including RN, LVN, CNA, and Caregivers. Objective: Get Clicks to Website from Highly Engaged Facebook Audiences who have an active interest in Physical medicine and rehabilitation, Physical Therapy and/or Surgical Procedures such as Plastic Surgery and Hip Replacement. Objective: Get Clicks to Website from Highly Engaged Facebook Audiences who have an active interest in conditions requiring infusion, including cancers, congestive heart failure, Crohn’s Disease, hemophilia, immune deficiencies, multiple sclerosis, and rheumatoid arthritis. 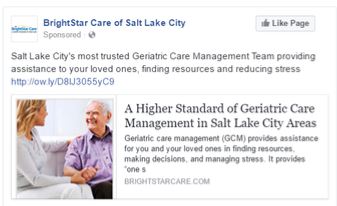 Objective: Send Traffic to Your Website from Highly Engaged Facebook Audiences who have an active interest in family care-giving, geriatrics and seniors 65+. Objective: Send Traffic to Your Website from Highly Engaged Facebook Audiences who have an active interest in family caregiving, Geriatrics and Nurse Case Manager, Social Workers and Physicians job titles. Objective: Send Traffic to Your Website from Highly Engaged Facebook Audiences who have an active interest in Autisim, Diabetes, Muscular Dystrophy, and Cystic Fibrosis, including parents and groups for special needs children. COST for Facebook Ads start at $1.00 Per Day and approximately $20 per 1000 reached. Previous Post Do you need a supplemental Pay Per Click Campaign?